Simon Pegg teams up with the voices of the Monty Python team to remind us to be careful what you wish for in Absolutely Anything. Unbeknownst to school teacher Neil Clarke (Pegg), a group of eccentric aliens decide to place the fate of humanity in his hands. When you read the names of all in this production you are immediately struck by the immense comedic ability that has been enlisted to do this film. And yes I did read up a little about the film before I saw it. And I still enjoyed it! 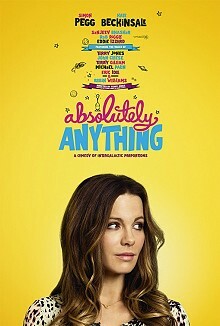 Absolutely Anything was clever and funny and the age-old question of "what would you wish for if you had all the power in the world" was answered and cleverly so. The downfall were the aliens. Although they were the heart of the plot: to destroy or save earth, their representation was so immature and unbelievable that it detracted from the film. See it anyway - a funny British film put together with some great comedians.